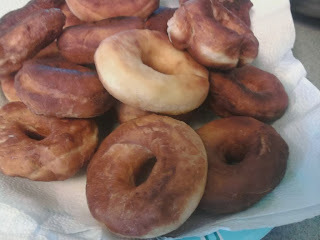 Turns out, the Brioche dough works WONDERS for homemade doughnuts. These doughnuts are slightly different from what you are used to. They are more like the French doughnut called the beignets. Mix up your brioche dough following the recipe and technique i provided on my recent blog post. After letting the dough chill and rise. Take a chunk of dough and roll it out to be about 1/4th of an inch thick. 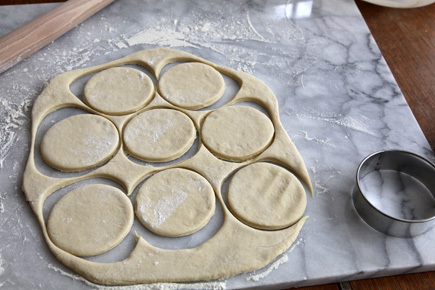 Using a round cookie or biscuit cutter, cut out as many circles as you can. 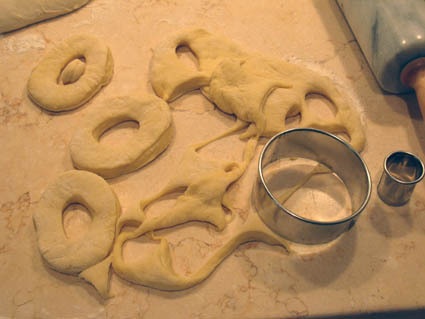 Using a smaller cookie cutter, cut the center of the larger circle out. Dont throw these little guys away. they make great treats to! Now its time to fry them! Using a skillet or a stew pan. Heat about an inch worth of oil to medium high. BE CAREFUL! OIL CAN BURN RIGHT THREW SKIN!!!!! Fry the doughnuts until golden brown and crispy. Takes about 30 seconds per side. Sprinkle with powdered sugar or create your own glaze.